Even if you are the biggest cat person, one thing you might not like is the litter box that comes along with indoor carts. Luckily, there are plenty of solutions to hide this unsightly pet accessory. By making a hidden litter box enclosure, you can prevent unwanted litter, odor, and mess around the house and give your cats a private place to do their business. We love our cats, and we know you do too, so it came as no surprise when we discovered several original DIY litter box furniture ideas. We're showcasing our favorite projects along with several tips to make the most of this cat space. Only the best for our feline friends, right? This upcycled furniture project is modern, chic, clean, and perfectly suitable for a litter box. By using chalk paint and some strategic trim placement, Amanda from Domestically Creative was able to transform a dated laminate hutch into something much more suited for her home and cat. For all the details and a cute picture of her cat, William, check out her blog post. We agree with Hannah from All the Little Details when she says that litter boxes are an eyesore. When she started shopping for litter box enclosures, she didn't like any of the results coming up, so she opted to convert a large wicker basket instead. She liked the wicker chest idea because the enclosure feels airy and light, and the top door makes every-other-day cleaning easy. Visit her guide to learn how the cat door was added. This cat tutorial from A Beautiful Mess isn't just about function; it's about aesthetics as well. The genius behind the idea wanted to upgrade the look of a basic litter enclosure and make it feel more like a cherished piece of home decor. Do you think they succeeded? If so, head on over to the blog post to learn how to make one for yourself and your cat. If you can find a cabinet with two doors and no drawers, you can make concealing a litter box a lot less cumbersome. Instead of needing to remove and convert any drawers, all you'll need to do is add a cat door. We love how Danae from The Homebody House organizes her litter storage area. She hung the litter pan on the inside of the cabinet door and stores other essentials on the top shelf. After renovating her home, the last thing Ashley from Sugar & Cloth wanted was her cat, Thomas to ruin all the upgrades with his litter habits. To combat the problem, she purchased a litter robot, which she talks about in detail, and then crafted a box to cover it up. She also suggests that there are covers available that you could paint if you didn't want to go through the trouble of making a box from scratch. Check out her blog to find out how you can make your own patterned cover. Giving a piece of furniture a makeover is one thing, but giving it an entirely new function is another. When you're searching for old furniture to repurpose for a cat cave, opt for pieces with a lot of interior space. Lisa from Recaptured Charm made this cabinet more suitable by removing two drawers and adding a hinged door. The larger door makes cleaning the litter box a much easier process. Find out how she did it, and how to DIY it yourself. If you don't mind losing some storage space inside a bathroom vanity, then under the sink might be the perfect spot for a litter box. Instead of cutting into the vanity permanently, Hannah from Letters from the Kennel decided to remove a door and add a curtain instead. Any litter that is kicked out of the box is contained inside the bathroom vanity and can be vacuumed up during the next clean-out. Read more about how Hannah made an under-the-sink solution work for her. The simplest way to hide a litter box is to look for furniture pieces you already have but might be underutilizing. Dana from House Tweaking decided to clean out the bottom shelf of a tall wardrobe cabinet and add a cat door to the side. When finding a cat door to work for this purpose, make sure it can be installed on a thin panel. For more details, read the rest of Dana's breakdown on her blog. When attempting this project, make sure you pick an end table that can fit over the top of your existing litter box with ease. The more space you have, the less likely that litter is going to end up everywhere. Jennifer from Dimples and Tangles transformed this Morrocan-style accent table using black spray paint and some striped fabric. Find out how she adhered the fabric to the table by visiting her tutorial. If you are into woodworking, then this concealed litter box idea might be perfect for you. Scott from Saw on Skates made an unused console table virtually unrecognizable by building doors and curtain panels and salvaging only the butcher block top and legs. Check out the detailed tutorial for easy to follow furniture plans complete with diagrams. Lindsay from A Design Story decided to build a custom litter box for her cat, Tebow. She originally had the litter box in the guest bathroom, but she quickly got tired of litter making its way into the bath and other hard-to-clean spots. By making a box, they were able to customize the size and contain all the litter inside. Get all the intel on how they did it on their blog. This bench that doubles as a litter box started as a toybox from Ikea. After some shopping, Alewood Furniture Co realized it was cheaper to tweak the toy box than it was to buy a litter box enclosure of the same size. To convert the piece, they added an opening to the side that was large enough for their cat, Lola and then sanded down the edges. Make it yours by checking out the website and learning more. Bethany from Reality Daydream acquired this vintage dresser for next to nothing and wasn't sure what she was going to do with it. When some new kittens came into the family, she didn't hesitate to convert the find into a concealed litter box cabinet. Check out her step-by-step guide to find out how she converted a pair of drawers into a door. If your cat is an avid scratcher, you might be familiar with litter flinging behavior that causes litter inside a standard litter box to end up everywhere. Kristi from Addicted 2 Decorating has a cat that does exactly that, so she decided to repurpose a storage bin to create a litter box with high sides. The litter is contained and the new box fits inside a utility cabinet. Find out how to make it yourself by checking out her website. 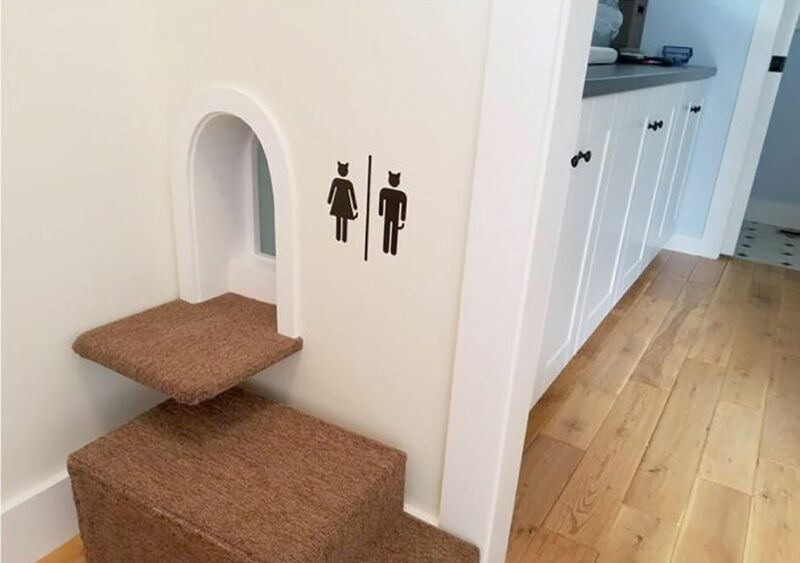 Julia from Cuckoo 4 Design created some clever cat decals for outside the litter box, and one of her customers used these decals on an incredible concealed cat litter box set up. The cat owners converted an Ikea cabinet into a cat's dream bathroom complete with fans and a motion sensor night light. We encourage you to read the post in its entirety. You will be blown away by the level of detail that went into this project. Many cat owners opt for litter box enclosures that have top entry instead of entry on the side. One reason for this is because the top entry makes it less likely that litter will find its way outside the litter box. Andrea submitted this cat litter hack to Ikea Hackers and shows readers how she converted this cabinet into a concealed litter box for her small apartment. You have to see it for yourself. Do you absolutely hate any sign of litter in your house? If so, extra precautions can be taken. By making a cat litter box that has two levels, you're better able to control the litter on your cat's paws. A mesh-like cat walk will collect excess litter as your cat makes your way outside of the litter box. Check out this step-by-step for all the details. Can You Train Your Ferret to Use a Litter Box?